EPA chief, climate denier and oil shill Scott Pruitt has reportedly allotted thousands to preventing leaks from the Environmental Protection Agency, including $3,000 spent to sweep his office for recording bugs. Known for his fiercely frugal stance on government spending, Pruitt’s counter-surveillance measures since his confirmation in January also include a 24-hour security detail, costing upwards of $800,000, biometric locks costing $6,000, and a soundproof phone booth for classified phone calls, costing $25,000. As first reported by The Hill, leaked documents reveal the EPA paid $3,000 to Edwin Steinmetz Associates to search Pruitt’s office for “covert/illegal surveillance devices” in March, only two months after his confirmation. 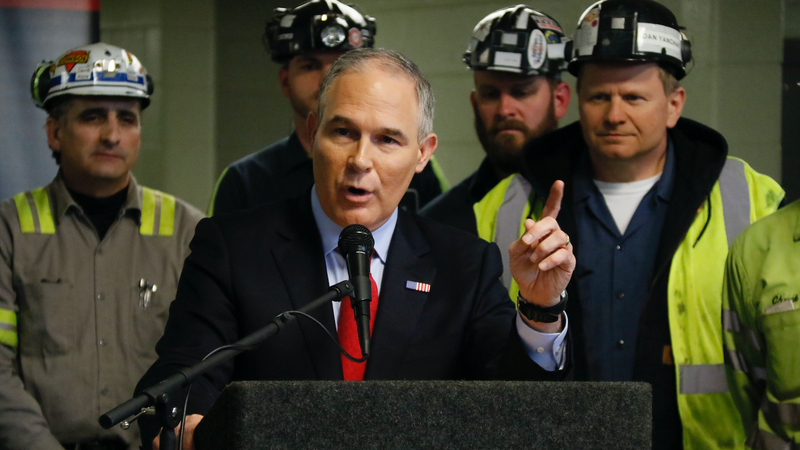 Mirroring Donald Trump’s presidency, Pruitt’s term as EPA administrator has largely been defined by a belief that, under Obama, the agency massively overstepped its bounds when creating environmental regulation. To counter this overreach, Pruitt supports both regulatory rollback and massive cuts to the agency’s budget, setting a “back-to-basics agenda” for the agency. His belief that the EPA needs to cut down on spending, however, is contrasted by an unprecedented apparent need for security. Similarly, Pruitt has suggested concerns about frivolous spending are prompted by “an alt-EPA” of EPA employees appointed by Obama. Last week, Mother Jones reported that Pruitt’s EPA awarded a no-bid $120,000 contract to a media monitoring firm called Definers Public Affairs. Not only had the firm monitored news coverage and tracked journalists, The New York Times reported, but one Definers executive had been investigating current EPA employees. The day after the Times story broke, Definers announced it and the EPA had decided “forgo” the contract. According to EPA spokespeople, Pruitt’s security measures are necessary because his enemies are legion. That doesn’t mean he hasn’t drawn internal scrutiny. Last week, the EPA’s inspector general confirmed it will investigate Pruitt’s $25,000 soundproof booth. The Huffington Post reports the EPA already has a soundproof phone booth, just on another floor. If Pruitt wants to increase security to ward off legitimate threats, that’s fine. But blaming radical leftists for his own inflated spending while simultaneously blaming Obama for previous overspending is insulting. Committing thousandsof dollars to leak-proofing the EPA as vital environmental justice and climate change research gets defunded is both insulting and deadly.